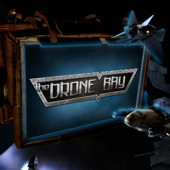 CrazyKinux's Musing: The Drone Bay: Episode 25 - We’re baaaack, no really! The Drone Bay: Episode 25 - We’re baaaack, no really! So here I was, sitting at work eating my lunch, when lo and behold as I'm reading emails, I notice a quick blurb by @Crovan in which he mentions that we've got 500 downloads so far. WTF? Downloads as in the new show? Frack! Once I had calmed down and headed over to The Drone Bay's blog, I saw the entry announcing the new episode! Anyways, let cut to the chase and give you all the links. Enjoy! First off, the show has a new host! We have added a fourth chair to our round table, and it is occupied by the lovely and talented Maeve Trinity! Maeve introduces herself and we hope that she’ll stick with us for many shows to come! For those living under a particularly heavy rock, our own CrazyKinux is a bit of a community icon in EVE Online. Just recently he held the 16th Blog Banter for EVE Online bloggers, and this episode contains a first-look announcement at what is next for the Blog Banter! The team also discusses Alliance Tournament VIII. Keep tuning in for more details as teams are announced and the days tick closer! For those wondering, Crovan will not be attending the tourney this time around, but urges you to follow it all the same! Tyrannis is next up on the discussion block with the impact that Planetary Interaction could have not only on industrialism, but also PvP habits and the viability of life in lowsec post-patch. Without a doubt the most exciting Tyrannis news is how you, the listener, could win a PLEX and a chance to interview a CCP dev right here with us on The Drone Bay! CK has started a contest ending Saturday April 10 at midnight. Details behind the link. This week also sees the return of Don’t Panic. We made the letters as large and friendly as possible this week, as we are beginning a series on small fleet composition and where you might fit into the roles you and your buddies need to come back home with ships (mostly) intact. No listener mail this week, as we decided people who wrote to us in the past had hopefully found their answers. If not, email us again! In fact, if you have any ideas, comments, suggestions, or questions, let us know! We are on the lookout for user segments! Our knowledge only extends so far, and that’s where we need you! We’ve already received word that Mynxee may have some self-recorded segments for us, and that should have you as excited as it has us! As promised, we have sponsorship details. Do you operate a corp, business, service, or anything else that could use some publicity? Do you like The Drone Bay and want us to run contests with sweet prizes? Well, the best way to do that is to sponsor us! E-mail either the show address or Crovan directly to discuss proposals and details. Sponsorships are ISK-only and we are only keeping it long enough to find clever and fun ways to give it back to the listeners! That could mean PLEX, shiny ships, or a lifetime supply of Marines (I’m looking at you, Maeve)!